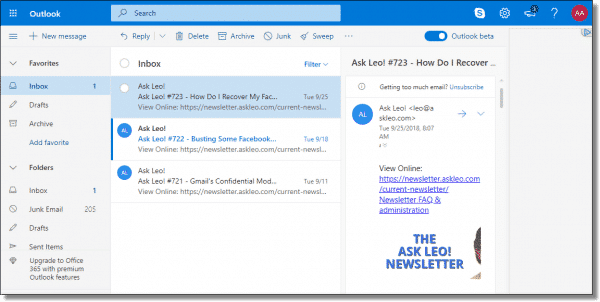 Back Up Your Email Using Thunderbird - Ask Leo! Using a desktop email program to back up your email is a very good way to avoid potential data loss. I'll show you how to backup your email easily, using Outlook.com and Thunderbird as my examples. Many years ago, shortly after Ask Leo! began, I received a panic-stricken email from an individual whose account had been hacked. He had lost all access to the account and everything in it. His panic stemmed from the fact that, for whatever reason, the only copy of his master’s thesis had been in that account. Hopefully, you’re not keeping something as important as a master’s thesis only in your online email account. That’s wrong on several levels. But I’m guessing there are things in your account you never want to lose, such as photos, correspondence, or other things you’ve exchanged via email. The problem is, of course, that if it’s only in your email account, it’s not backed up. Let’s fix that. Let’s back up your email. For this article, I’m going to use a Hotmail account – askleoexample@hotmail.com. I’ll continue to access that account as I usually do, using the Outlook.com website, but we’ll back it up to my PC using Thunderbird. The technique I’ll use applies to almost all online accounts, including Gmail, Yahoo! and others. For this technique to work, the account must support a protocol called “IMAP”. The good news is that IMAP is a common approach used to access email, and almost all email services support it. 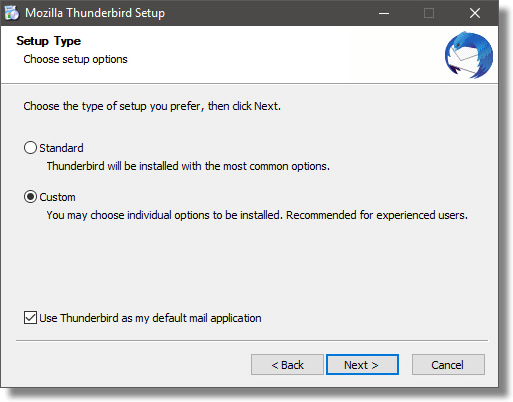 In this example, I’ll use Thunderbird as my desktop email program, but any desktop program that supports IMAP can back up your email, including Microsoft Office’s Outlook, and others. The first step is to download and install Thunderbird. Download Thunderbird from the official download site here2. At this writing, the official URL is https://www.thunderbird.net. Download and run the Setup Wizard. The first choice is whether to accept the Standard settings or use “Custom”. Create icons on the Desktop, Start Menu and Quick Launch bar. The installation location for Thunderbird. If there are additional options, read them carefully to make sure you understand what it is you are agreeing to. Click Install on the last page of the Wizard to actually install Thunderbird. 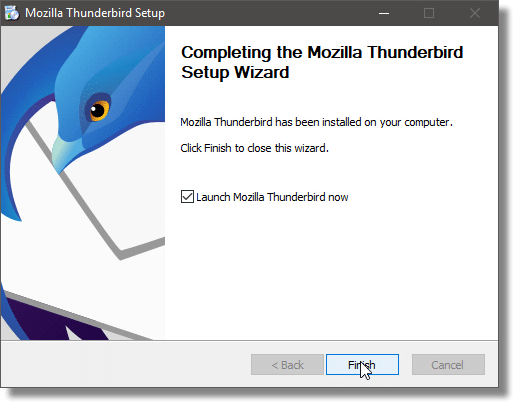 When the installation is complete, leave “Launch Mozilla Thunderbird now” checked, and click Finish. When run, Thunderbird may offer to import settings from another mail program if one is installed. Since our goal here is simply to use Thunderbird for backup and we’ll be configuring the account ourselves next, there’s no need to import anything. When you first install Thunderbird, there are no email accounts configured. Thunderbird proceeds to the “Setup an Existing Account” dialog. Enter your name, email address, and password. In my case, I’ll enter “Ask Leo! Example” as my name, “askleoexample@hotmail.com” as my email address, and my password for that account. Select Remember password if this computer is secure and you don’t want to type in your password every time you fire up Thunderbird. Click on Continue, and Thunderbird will consult its own database of email providers for the correct settings. Hotmail is in that database. Make sure that IMAP is selected and click Done. Thunderbird is now configured to access your Hotmail account and will begin downloading your mail. The benefit of using IMAP is that the email program will download a copy to your computer, creating a backup of your email. You can continue to use your email as you normally do via the Outlook.com web interface, your mobile device, or wherever else you’ve been accessing it. You can, if you like, use Thunderbird to actually read, compose, and reply to messages. Email you read here will be marked as read elsewhere. In fact, any change you make, such as moving emails to folders, deleting emails, or otherwise managing your email messages, will show up in all the places you access your email. Since IMAP mirrors the activity on your online account down to your PC, note that it will mirror deletions as well. Delete a message online, and the next time you connect Thunderbird, the message will be deleted locally as well. Backing up your PC regularly3 may provide you with an additional safety net, since the Thunderbird repository would be included in those backups as well. To back up contacts, you need to manually export them from your email provider. Contacts are not included in the email protocol, and thus are not included in anything we’ve done so far. In Outlook.com, contacts are “People”. Click on the menu icon to the left of Outlook.com in its header, and then click on the resulting People icon. On the People page, click the Manage menu item, and then on Export for Outlook.com and other services. Since this is a backup, we choose this format in case we ever need to import them back into Outlook.com. Save the downloaded file somewhere on your computer, ideally in a place that will also be backed up by your regular PC backups. If you don’t use Thunderbird regularly, it’s important to run Thunderbird periodically to perform its backup. Once a day, once a week, or a couple of times a month, depending on how current you want your backup to be, run Thunderbird and keep it running until it’s downloaded a copy of all updates to your mail. Similarly, since there’s no automated download of your contacts, you’ll need to do that regularly as well. The good news is that your email is backed up! Particularly when used in conjunction with ongoing PC backups, you’re well protected against data loss due to account theft or other problems. But, in all honesty, I still wouldn’t keep the only copy of my master’s thesis there. That’s worth a few more copies in other locations for safekeeping. Will Backing Up My Computer Back Up My Email? - In order to figure out how to back up your email you first have to figure out where it lives. It might be on your computer; it might be out on the internet. How Do I Back Up My Outlook.com Email? - Outlook.com accounts are hacked into and lost every day. I'll review a couple of techniques that ensure you won't lose email or contacts if it happens to you. 1: My editor asked me: “If it was in his email account, he had either emailed it to someone or received it from somewhere else, so wasn’t there hope of recovery after all?” — Perhaps. My assumption was it was probably saved as a draft email and hence never sent. Regardless, it was a bad way to “save” something, and by the time he came to me he’d apparently exhausted any options and hope for recovery. 2: It’s critical that you download only from the official site. 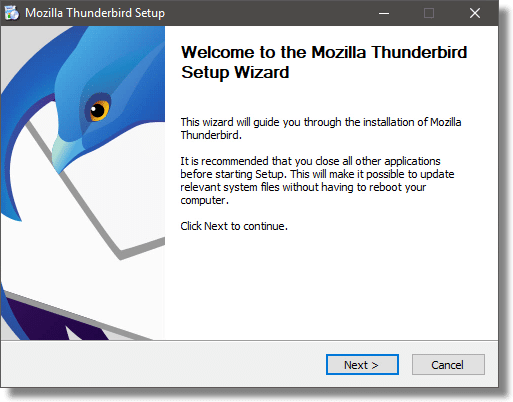 Do not get Thunderbird — or any software — from download sites or aggregators unless explicitly instructed to by the official site. Almost all download sites now add unwanted software in addition to whatever it is you’re looking for. 3: Which you should be doing already anyway. Right? 4: Importing contacts from one service or program into another, while possible, is notoriously error prone, and almost always results in some amount of lost data. This has to do with the lack of standards about what information is included in a “Contact” and how that information should be represented. « Previous post: Critical: Back Up Before the 1809 Windows 10 Update! I’ve only ever used the web interface to access my hotmail account, because… Well, just because really. No other reason than that’s the way I’ve always done it. I had never even thought of using an email program, like Thunderbird, to create a backup. Thanks very much for posting this article. My email is about to be backed up! Will this method also back up sent mail and drafts (from gmail to Thunderbird)? Or does it only back up the inbox? It should back up all folders. I could not get it to back up folders. It might be easier for me to simply e-mail myself on my primary e-mail Outlook client the ones that I want to save. Perhaps you accidentally configured POP3 instead of IMAP. Everything should be replicated everywhere if you did it right. You can use a program called Mozbackup to backup your entire Thunderbird profile. That way, if some disaster happens, you can do a restore pretty easily. I run Mozbackup nightly before shutting down my laptop. I’ve lost all my email, files, contacts, etc., twice in the last five months. First time because my laptop literally melted inside four days after I’d done a backup. Was able to retrieve all info except email material from the backup. Two weeks ago did a complete backup – new Dell laptop – on clickfree and although it claimed to have backed up over 140,000 emails, all info disappeared again. I’m using Windows Live 2012 and there’s no mention of this program in your Thunderbird info. This is driving me crazy. How do I safely backup all my email info? Is there a program that handles it? Thunderbird is the program to use to back up your email. If you have it set to access your emails using IMAP, the emails will remain on your computer and on the email provider’s server. If you are using POP3, you can go into Thunderbird’s account Server Settings and check the box to Leave Mail on Server. Backing up your computer should back up the email stored in Windows Live Mail. Gail: Instead of using Windows Live I would and do use Thunderbird. It is a PC based email program. It is created by the Mozilla Foundation. The program is second to none! I use Gmail and and have Thunderbird configured to download email from my Gmail account. Unlike Leo I use the POP3 configuration of Thunderbird instead of the IMAP configuration. I don’t have a smart phone so there is no need to synchronize my emails across many devices. As far as baking up the emails, again thanks to Mozilla we have the Mozbackup program. This small program from Mozilla will backup not only all your email but all your email settings as well. And not only does it backup it also restores should your Dell laptop crash. And not only does it backup and restore Thunderbird it also backups and restores another Mozilla product: Firefox browser! And it does both in under two minutes. I use Mozbackup daily. I Backup to a folder I created under “Documents” called “F&T Backup”. I then copy that folder to a flash drive daily and once per week I do a full image backup using Macrium Reflect to an external Hard Drive. In this way I have never lost an email. One feature found in Thunderbird and probably all other email programs is “Leave mail on server” found under Server Settings. That even has one advantage over IMAP, in that if you accidentally delete an email in the email program, it still remains on the server. A disadvantage is that you have to go into the web interface to delete email, but this is very easy to do, and it’s probably not even necessary as Gmail offers 15GB, and ever increasing, storage. That’s probably enough for all the emails the average user has ever received and will receive in a lifetime. I am using WIN XP PRO V.5.1.2600 SP 3.0 32 bit on a desktop, my email is Microsoft Office Outlook, & I am using Firefox as my main browser. I am a senior, just wanted to know if I can use this info to back up my emails, I mean how different are the steps? I have a frustrating history of following these ideas, only to find that what I’m seeing on my screen isn’t what was shown or expected……massive time wasting, bewilderment and frustration ensues….mostly resulting in me giving up…. If I could pay someone to do these things for me, I wouldn’t have to rely on others so much, my life would be so much calmer, I am so grateful for people like Leo who help confused people like me…. So thanks Leo, but can I, ME, do this reasonable easily…. You don’t need to. Or rather, you already are. Microsoft Office Outlook is UNRELATED to Outlook.com. In fact, Office Outlook is more like Thunderbird – it downloads your email to your PC. So as long as your PC is backed up, you don’t need to take the steps in this article – because in a sense, you already are. I’m using Outlook. Can’t I simply move my account files to an area that does get backed up? Or use a program such as PureSync? Outlook as in Microsoft Office’s Outlook email program? Then yes, make sure the Outlook files (pst and ost files) are getting backed up as you back up your PC. Outlook as in Outlook.com? Then, no. Outlook.com is an ONLINE email service. You want to use Thunderbird (or an email program like it) to download your email to your PC where it can be backed up. Yes, Outlook as in Microsoft Office’s Outlook email program. Thanks for the confirmation. Of course, I always keep a System Image as well, and the people that don’t do this are asking for trouble. What is the directory name (& path) where Thunderbird saves all the emails in the computer hard disk? 1- Thunderbird database is hard linked to the installed Thunderbird program. 2- Thunderbird may not back up Sent email or sub folders. I use GoDaddy eMail in my browser. I spent hours trying several email clients to back up my email account. Thunderbird seems to be as good as it gets. But there were two major problems. The second problem is that Thunderbird did not back up any folders other than my inbox. It did not backup my SENT email folder or any of my INBOX folders. It could be something with GoDaddy email or maybe not. If you use Thunderbird from the start, I am sure any folder structure would be backed up … but still, check. The work around was to transfer everything into my inbox. This was the deal breaker for me and I decided to pay for more online storage space. For as important as email is in the world, there are no real methods to bulk archive email to ones own offline storage. I would specify it be done without a cryptic and fragile data base that cannot be recovered or opened in common software. There is an opportunity here for a developer. I stopped using Outlook back in the 90s when I realized that the database was hard linked to the installed Outlook program. I had to by third party software to crack the database to recover critical software. I never considered Outlook again for such a critical oversight. Thanks for this wonderful article Leo. I’ve been using Microsoft Outlook (NOT the web .com one) and I can see the .pst file and others. These files are included in my scheduled backup plan – so it’s fine for me. What really attracted my attention is that you mentioned that the Thunderbird backs up the email file in a text format rather than in a proprietary one as Outlook does. May I ask whether the backed up mail file from Thunderbird is a big file OR is the backup file consists of individual separate files one for each mail? Suppose if I want to see a particular mail I receive on a day, say, two months ago – how easy is it to find this mail from the backed up file from Thunderbird? Do I have to restore the whole set of emails and then find it from there OR can I just read the mail or mails straight from the backed up files, since they are in .txt format? Can you giveme a little bit more insight on this? Thunderbird stores email in one plain-text file per folder. (There’s also an index file, but that gets rebuilt as needed.) You can just open the file in a text editor and search for your message. I use TB for everyday use for all my eMail accounts and remove them from the original Gmail, etc. accounts. I want to back up my TB emails but file history in W8 doesn’t seem to capture the appdata folders. Is there a way around this? Hi Leo ! Thanks for this great article ! A month ago, I configured Thunderbird (38.0.1) for my Hotmail account with the IMAP protocol. The initial synch was quit lengthy (a few hours) as I have many folders and mails, but after that it was quite ok … This morning, for no apparent reason, my folder pane in Thunderbird came up empty and I quickly realized that Thunderbird was resynchronizing everything from scratch … After a second or two, I got my list of empty folders, and then the lengthy synchronizing restarted all over again for all my emails … As the process was unfolding, I had a look at the profile repositery on my hard drive (C:\Users\User\AppData\Roaming\Thunderbird\Profiles\…\ImapMail\imap-mail.outlook.com) and I could see that all the .msf files where empty ( 2 KB each ) and being rewritten. Do you have any idea what happened and how I can avoid it in the future ? MozBackup is a utility for creating backups of Firefox, Thunderbird, SeaMonkey and some others applications. It allows you to backup and restore bookmarks, mail, contacts, history, extensions, cache etc. Thunderbird also allows you to leave your mail on the server when configuring Pop3. 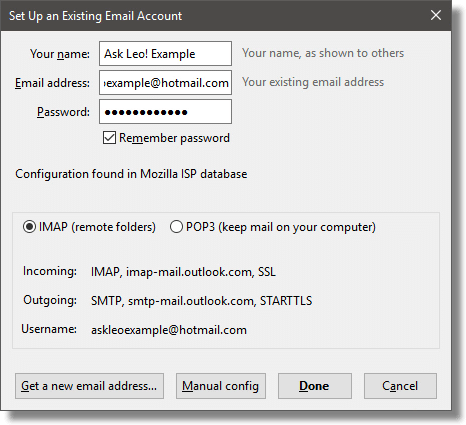 Is there any disadvantage to setting up Gmail access as Pop3 rather than Imap? If you use POP3 then when you delete something from your computer, or phone, it will not delete it from the Gmail servers. So the mail will build up there. The advantage is that makes kind of a backup. But the disadvantage is that you may run out of room. 1. To disable POP altogether, to enable it for mail that arrives from now on, or to enable it for all mail, even mail that’s already been downloaded. This option comes handy to prevent duplicates when restoring a desktop e-mail client (after you reinstall Windows, for instance). 2. To chose what to do with messages once they have been accessed with POP by your e-mail client. There are several options, ranging from “leave them there, do nothing”, to “delete them”. The latter, I believe, transfers them to the Trash folder, where Gmail deletes them completely after 30 days. So all manners of paranoids can be satisfied : if you want two backups, one on your desktop and one on Gmail’s servers, you can have that. And if you’re paranoid about your stuff staying at Google for privacy reasons (like me), you can have that also. Your e-mail client is supposed to offer also a “Leave messages on server” option (my Outlook 2003 certainly does), so you could also use that to scrub your Gmail account as soon as you’ve downloaded your mail (or even after x days). Gmail settings are supposed to take precedence over the desktop client’s in certain cases, so check it out (I believe this is geared to keep you on the safe side, i.e. not delete your mail if you’ve overlooked the issue somewhat). Path to settings : / Settings / Forwarding and POP-IMAP / POP download. Things like: when you make changes in Thunderbird (like deleting an email), it’ll NOT be deleted in Gmail. Thunderbird gives you the option to delete mail from the server when you delete it from Thunderbird when you use pop3. It also automatically delete mail from the server after a time period that you choose. I’ve never tried this feature as I use IMAP, so I don’t know how well it works. Hi Leo — OK, let’s be upfront about it… I’m a Luddite who’s still using AOL for their email as I’ve had it forever and been reluctant to change email addresses that I’ve had for a long time, plus they offer “unlimited” email storage. I quit paying for their service years ago, and while for years they only offered knowledge bases and useless forums for service, they now appear to offer at least limited live support (I needed to reset a forgotten password recently and actually got a live agent to help me). So my two questions for you are — a) is AOL any safer than other “free” email service, and b) does Thunderbird play well (or at all) with AOL — as I’d prefer to back up my tons of email in a safer location than AOL’s servers? Thanks for all your great articles over the years. I’ve learned a lot from you! AOL’s in the same bucket, from my opinion, as other free services. No better, no worse, really. That you got any live customer support surprises me. May I mention a program I haven’t really used myself (yet), but I installed it and sort of kicked the wheels around : Mail Store Home. It’s specifically geared to mail backup (and search), and its approach seems quite interesting. For added security, you can backup your mail from your Thunderbird backup or from your desktop Outlook backup (especially interesting because of those weird, proprietary, huge .pst files Outlook keeps everything inside) ; but also from Windows Mail, Windows Live Mail or Sea Monkey. But it’s also able to directly backup webmail accounts such as Gmail. It’s free for non-commercial use, the original company is German (spelling reliability, at least according to my own prejudice) and has been bought by Carbonite. Give it a try. Hi! I accidentally clicked “YES” when it asked if I wanted Thunderbird to be my “default” email…but I don’t want it to be! And now I don’t know how to UNDO that! How do I return my Hotmail as my default email? I’d have to know what version of Windows you’re running. If you access Hotmail via going to outlook.com then you may not need to do a thing. I’ve installed thunderbird and loaded my messages from a hotmail account. I want to close the hotmail account, but I don’t want to lose the messages on thunderbird. How can I make sure the messages are safely backed up? Invalidate the account information (the IMAP settings, specifically) so that Thunderbird can no longer connect to Hotmail. ANd of course back up your PC. And if you are configured (like I am) with OS/Apps on C: and all user folders on D:, you may want to relocate the profile folder for Firefox to a D: as well so that if you have to restore an image of C: you won’t lose your emails. You can backup the Firefox folder when you do a file backup of everything else on D:. I’m reply to my previous post. I downloaded an add on for Thunderbird called “ImportExportTools” and I’ve saved all the emails I wanted to PDF files and plain text files. Saving the emails in plain text allowed me to save the attachments. I plan on running a image backup later today to back up my emails. I have my main e-mail account on gmail and in gmail settings I had chosen to automatically forward a copy to my another e-mail address of outlook which I use as a back-up for all my e-mails which I get on gmail. I’d love to use Thunderbird to read my gmail account but gmail refuses to let Thunderbird access it, claiming that Thunderbird is not secure enough. Is there a workaround for this or have I just been securitied out of using this helpful program? Thunderbird works for all my other emails. I believe there’s a setting you can change to allow “less secure apps” via https://www.google.com/settings/security/lesssecureapps. It sound’s like you’ll have to go into GMail’s settings and enable IMAP or POP3 before you can use an email program to access your emails. Dear Leo I have been using TB for many years on my Mac Book Air and been very happy with TB. But I did the last update and I was no longer able to use Photo resize to resize my photos when emailing them. Do you know of a another program that will work with the new upgrade? That anecdote reminds me of a movie with Brendan Fraser and Joe Pesci called With Honors which has a strong backup theme. His computer crashed, and he only had one copy of his thesis, so he went out in the snow to make a photocopy of his hard copy. He slipped on the ice and his thesis fell into a coal shoot. And Joe Pesci ransomed the paper to him page by page. Lesson from that: one backup is not enough. If one system goes down, you are left with only one backup. So a corollary to Leo’s “if it’s only in one place, it’s not backed up” might be if it’s only in two places, it’s not backed up enough. Great article on Thunderbird to backup emails. I have 5 accounts in Gmail and back them up with MS Outlook, which works well. But the direction that MS is taking with Office, Thunderbird is a great option. I downloaded 4 of my accounts into TB with no problem, but the 5th (my main account) will not work. The only folder that downloads is Inbox and a notice pops up that it did now succeed and is not connected to the server. All 5 accounts have the exact same settings and I can’t figure out why this last one will not work. The only difference is that the TLS with gmail and Outlook is port 25 instead of 465. But the first 4 accounts downloaded perfectly as 25. Any suggestions? I just downloaded Thunderbird…but…when it asks for current e-mail address and password…I get an error message stating info could not be verified. It asked if I had the correct address and password. I did have the correct info. “Your account is currently not enabled to sign in from apps, that do not meet modern security standards (ex. Older versions of mail and calendar apps such as Outlook). As a result, we prevented a sign in to your Yahoo account (xxxxxxx). We strongly recommend that you switch to Yahoo’s apps such as Yahoo Mail on desktop and mobile and remove your account from all other less secure apps. Is there a work around for this issue? The workaround is “Allow apps that use less secure sign in”. It’s not nearly as bad as Yahoo! makes it out to be, and it’s basically intended for this situation exactly. Thanks for the quick response. But will you elaborate on why “It’s not nearly as bad as Yahoo! makes it out to be” ??? Should I not be concerned about “a less secure sign-in”? That is correct. I am not concerned about it. As I understand it they, (and google) are attempting to promote / force a technical upgrade at the level of the protocol used to connect. While that’s a good thing, it’s simply not an issue for the majority of people. When used in conjunction with a PC backup, would I be backing up the “Profile” folder? Thanks! Yes. If you look within that folder you should see all of your email, email folders and more. Oh now I understand backing up with ThunderB, simply download the emails. I was looking for a back-up option within TB. Thanks for the hint Leo, although I have been using Gmail and hotmail for longer than I can remember and so far, touch wood, no problems. Sorry if I missed something; Re backing up email with Thunderbird, this was helpful, but how do I back up my CONTACTS in GMAIL, not in Outlook? Thank you. You need to export them from Gmail and save the file. Can you do this with more than one email account? I have a gmail, a yahoo and a hotmail address. I’d like to back them all up just once to get an archive on my harddrive. I don’t really care if they end up jumbled together. If so, how would I go about it? Do it once for each separate account? Thanks! Yes, I have 3 accounts backed up with Thunderbird. You can use Thunderbird to manage several accounts by the add account feature. Each account has its own folders by default. Sure. You can configure multiple accounts within Thunderbird. I encountered a problem when configuring Thunderbird to access my Hotmail account, I kept getting a message stating that my username or password was incorrect, I then logged in and out of hotmail several times thus confirming that they were correct. I eventually (several days later) traced the cause to being that I had outlook two-step verification turned on, I turned this off and the problem is now solved. Does this now mean that I have down rated my security? Sorry if this doesn’t read well but I’m a prehistoric when it comes to computers. That definitely removes a layer of security. Yes, I would turn two-step back on, and then get what’s called an “application password” from your Microsoft account’s security settings. This is a password intended specifically for use by (and only by) devices that cannot supply two-factor. Hello, I have been recommended you by hot chilli to back up before they disappear but only the inbox has backed up, how do I get the sent mail? Thank you from a novice. If you set Thunderbird up to access your email via IMAP instead of POP3, it should download all of your email folders. Thank you for the helpful article. The reason I found it interesting is that I have the impression outlook.com (hotmail) deletes old mails, i.e. the inbox dates back only a year or two, everything older disappears, then again, the old mails reapper … but if one day, they’re really gone, then Thunderbird also would not help since it would also delete these old mails as soon as connected, right? Any remedy? If you’re backing up your computer, the emails would reside on the system image backup. Sure. Backup your Thunderbird data files. Or better yet, move the emails from one of the account-syncronized folders to a local folder that’s not associated with any email account. I use TB all the time – the biggest advantage is I can check into , and deal with 10 email accounts with a single log in – huge time saver. Just wish there was an Android version. Use Maildroid there, but of course that doesn’t save locally, and also won’t deal with Gmail due to their security protocols. I use the free “TypeApp” mail app on my android device. Highly customizable UI and mail management functionality. Can handle multiple accounts in one UI, is Gmail friendly out of the box, supports WebDAV & CalDAV for third party domain mail (like my business websites email & calendar, and lots more. I’ve sworn by this app for years. Bluemail is by the same company, and very similar. It does not do a local backup to my phone but like Leo said, do you really want a local backup on a mobile device? Thank you. You and your team rocks. Commercial and free backup programs like Macrium Reflect and EaseUS Todo allow you to schedule the time of your backups. If you want to do it like your old Unix days, write a DOS batch file (or a Powershell or Visual Basic script) and set up the Windows scheduler to kick it off. But just like in Unix, it’ll take you several passes to get it debugged and reliable. There are many example scripts on the internet (Google something like “powershell script to backup files and folders”). Ive used Thunderbird for many years and back u to my own PC and external drives using Mozbackup. Remember that every time you change your e-mail password, you have to sign-on to Thunderbird and make that change. It’s easy to think that Thunderbird is always in the background saving all e-mails, but it can’t do its job if you’ve changed your password. Good idea to sign-on to Thunderbird periodically to make certain it’s in gear with all e-mail services you have — it will tell you if it can’t sign-on to one of your accounts. It should work, but be careful. If you delete the mail on the server and run Thunderbird while the mail is no longer on the server, the mail will be deleted from Thunderbird also. Back up your Thunderbird emails before doing this. thanks for the reply. What I would really like to know though is this: can I get the mail back on the server from the backup? (after it has been deleted from the server earlier). The person I’m doing this for uses multiple devices to sync mail to and would like to be able to access all of his mail from every device after the mail server upgrade. Yes, it can be restored from the backup. (That’s what I meant by “It should work”). 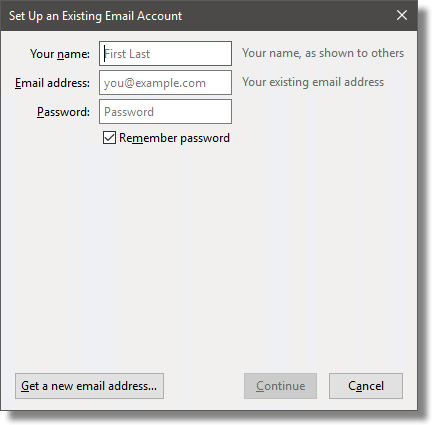 Access the account via IMAP in Thunderbird or any email program. Copy the emails into their respective folders and they will all be uploaded. In fact, if you have another email account, you can copy those emails to their respective folders in that account and use that account as a backup account. Yahoo!Mail handles e-mail for AT&T and calls it Webmail. I can access my e-mail from either AT&T or Yahoo!Mail. Does anyone know whether I can find a way to use Thunderbird, or is this impossible because Yahoo!Mail does not offer POP3 or IMAP? Does anyone know whether I can move all my e-mail to Spectrum, for example, if I drop AT&T? Yahoo Mail is accessible through Thunderbird or any email program via SMTP or POP3. I get my Yahoo Mail via Thunderbird. Operating system Win XP Pro on two separate systems. Will be getting a new computer with Win 10 some day, but not today. Outlook available is 2003, however I stopped using it when it would not function years ago due to size of emails I assumed. My Hotmail is accessed via Chrome browser with no issues other than size of emails on line. Researched Systools, Advik, and Thunderbird for my Hotmail “download” solution. 1. I successfully copied all my emails after installing Thunderbird on to my computer. Seems to have worked fine with only a few emails loosing dates, etc. No big deal. (from other comments I read, I will add, it appeared to have only download the Inbox emails automatically from what I could visually observe. And all my folder structure, but could not see emails. All I did was click on each and every folder individually (both system and my personal structure) and all emails appeared or downloaded. But they would not show up until I clicked on each folder for the first time. They all remain viewable and operational now with no further actions). Everything appears to be fine and Thunderbird is operating as advertised and I have been running TB for a week to check things out. 2. I successfully downloaded (exported) my contacts from online to my computer using instructions in the article. CSV file was placed in my backup area. However, when I uploaded/Import the contacts from my computer to Thunderbird, they imported but don’t seem to be easily viewable in a usable format. This is not a big deal either since as you say, they are at least backed up on my computer, but just passing along. I may have mixed some formats up, but the instructions in the article were not that detailed. 3. The article did not mention calendar info. Its no big deal if I can’t get the Hotmail calendar info, but would be nice. 4. I am in the process of moving the Thunderbird profile info to a second computer with Thunderbird installed in an “offline” status so I can scan and search for any of my years of emails following the instructions Leo provided in the “How do I move my Thunderbird-based email from one machine to another?”. I will place comments/questions on that thread. Once I have this true backup on another computer and I can access them, I will delete 2/3 of my online Hotmail emails. If all is successful, I will be able to stop paying for the increased mailbox size…yay! How do I download/backup my Hotmail online calendar info to my Thunderbird on computer? Thanks Leo for all you do! Been a fan for years. Honestly: I don’t know. Calendar interoperability is even worse in many regards than contacts. Sorry I don’t have a better answer. No worries, just wanted to ask. Thanks! !